The History Behind A Sighting? In the alleyway behind this church (Between NW 9th and 10th Streets; between Blackwelder and Indiana in Oklahoma City) is where I witnessed the apparition of an older woman dressed in late 1800's garb. I know very little about the history of the neighborhood but if you're a long-time OKC resident and know of the area, I would love to hear any tales you might have. More sightings of a huge flying creature, originally reported by KENS, have prompted an investigation to determine if it is a monster or myth. "Even though it was dark, the thing itself was black. The blackest I'd ever seen," said Frank Ramirez. Years ago, Ramirez thought he was after a prowler in the back of his mother's Southwest Side home. But what greeted him on the garage rooftop still gives him goosebumps now. "That's when the thing up there turned to me, and it was in a perched state, and it started to turn," he said. "It started to move its arms and this giant blackness was just coming out. At that point, I dropped the stick and I ran." "If you were to take a man's face and pull his chin down, just like a stretched face," said Ramirez. While at times cheesy, and most likely faked, it is nonetheless a rather entertaining video to watch. I love all the creative things you can find on YouTube. As you may know from my previous posts, I feel YouTube is best taken with a HUGE grain of salt and should never be considered a scientific forum for presenting evidence. There are just too many 17 year olds with a camcorder. This year, although nearly over, marks 60 years since the famous crash at Roswell, NM - an incident that has left an indelible mark upon both the UFO community and popular culture. Each year since 1996 the city of Roswell hosts a UFO festival after Independence Day to commemorate the original incident, which occurred on July 4, 1947. 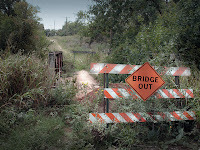 While a certain boon to local tourism, this small Southeast New Mexico town may have continued to slumber in relative obscurity if it weren't for a spate of books, television programs, and films about the crash that burst like wildfire onto the scene in the late 80's and early 90's. While some may look upon the kitsch and crass as a mixed blessing, it stands as a prime example of how encouraging local paranormal history can certainly lead to profitable ventures. Other sleeping towns looking to bolster their own influx of tourist dollars might take a second look at what Old Man Jones said landed in his pasture or what those "crackpots" are saying about what was seen in the Old Smith house. Everyone from serious paranormal investigators to the neophyte can capture an orb on film. Even drunken teenagers, stumbling around a moonlit cemetery can achieve the same results. Orbs seem to be as common as houseflies and yet they are the source of unending excitement and debate. These innocuous spheres, which range from translucent to totally opaque, come in every color and size. It seems these days that your ghost hunting isn’t worth its weight in gold if you don’t come back with a least a few images of these apparently noctilucent spheres. However, not all investigators believe this phenomenon is paranormal in nature and this conflict has sparked more than one heated debate. Their relatively new presence, ubiquitous nature, and dubious authenticity are what make orbs so controversial. It is this very controversy that I wish to dissect in hopes that a clearer under-standing of what constitutes a True Orb (if such a thing does exist) will emerge. As well, it is paramount that novice and expert alike learn to distinguish contaminants from orbs and establish an agreed-upon protocol, vocabulary and morphology for the supposed True Orb. Orbs are considered by some paranormal investigators to be the spirit in its purest form. When you don’t actually see a ghost, it is thought to be in this invisible or near invisible, spherical form. An apparition, on the other hand, is the spirit adopting a recognizable shape, often the one it held during life (this is, of course, based upon the belief that the apparition is the sentient soul and not a psychic anomaly). This vestigial form is what we actually see with our eyes when we observe the “phantom down the hall” and can identify it as a person, if only in the loosest sense. However, according to orb proponents, the spirit can also shed this residual appearance and return to its pure, orb state. Stories of glowing spheres of light have been ghost lore for centuries. They have been referred to as Will o’ the Wisps, Spook Lights, and Ghost Lights. However, in this analysis, we will concentrate only on those orbs that are considered invisible to the human eye yet appear in photographic or digital images. Therefore, accounts prior to the advent of the camera will be negated for several reasons that shall become apparent as we continue. Perhaps the earliest image of an orb may have been photographed at Joe’s Prune Orchard in Gilroy, California sometime during August 1896. A worker was purportedly photographed with a camera obscura, also known as a “pinhole camera,” which utilizes no lenses but rather focuses light through a tiny, “pinhole” aperture. In the developed image, an orb appears to float a foot above the ground near the workers legs. Since the camera obscura has no lenses, it is highly unlikely that an out-of-focus speck of dust could have created this image, as is often the case with lens cameras (more on this later). If this image is to be believed, then orbs may very well be a real phenomenon. However, since I have no proof the image was truly shot with a lensless camera – nor have I examined the original plate negative – I cannot fully comment on the authenticity of this image. The next interesting case of photographic orbs occurs in 1909 when Julian Ochorowicz experiments with a psychic medium named Stanislava Tomczyk. This psychic claimed she could channel the spirit of “Little Stasia.” During his experiments, Ochorowicz had Tomczyk place her hands over, but not onto, several photographic plates. The resulting spherical images produced from the developed plates are often thought to be orbs, channeled by the medium, into a sort of psychic contact print. [Rolf H. Krauss, Beyond Light and Shadows] However, it may have simply been the photographic emulsion’s susceptibility to the heat or bioelectric field given off by Ms. Tomcyzyk. In the summer of 1972, Mr. M. R. Lyons of Nottingham, England captured what some today believe is an early orb photograph as well. Lyons had been photographing various sites in the Derbyshire Peak District and noticed nothing unusual in any of the scenery. However when he returned and his pictures were developed, he noticed one print revealed a “ball of light,” which seemed to float two feet above the ground. Yet, these orbs were none-too-prevalent until the advent of the compact, instamatic camera with built-in flash. These affordable cameras integrated a reusable, immobile flash into the camera body itself instead of the older, detachable models with their single use flash bulbs. The flashes for these older cameras were mounted further away from the lens and could be removed altogether when necessary. However, to maximize space on newer cameras, the flash units were integrated into the body, placing them much closer to the lens. As these cameras became increasingly popular throughout the late seventies on into the eighties and nineties, the increase in orb occurrences rose. I believe this is too much of a coincidence to dismiss. Orb Classification There are, in my opinion, two classifications of orbs: True Orbs, which may or may not be a spirit or psychic-based phenomenon, and Refraction / Reflection Orbs. Since even the “experts” cannot seem to agree on what constitutes a True Orb and no definition or models exist for one, we will concentrate on what an orb is not. So what happens when something very minuscule rests on the lens, or floats nearby in the air? Well, in addition to the aforementioned diffuse glow, these objects are outside the camera’s point of focus so the image cannot be fully resolved. It is the same thing as placing an object too close to your eye; your eye cannot focus the image, so it appears blurred. Now when objects are blurred, they appear larger and more diffuse, so a small speck of dust or moisture droplet can appear as a translucent, “glowing” orb. These situations are especially prevalent in cameras where the lens is situated close to the flash. This proximity increases the opportunity for halation, reflection and internal refractions to occur. The Controversy As you have read, this misidentification of ordinary contaminants poses a serious threat to the integrity of photographic orbs. Their prevalence alone gives one pause and many photographs, devoid of any paranormal activity, will exhibit this same phenomenon. Yet a proponent will simply argue that it actually was an active site or they may equally dismiss the anomalies as not truly orbs. This is done sometimes by claiming a distinction in the morphology of True Orbs. Some will claim that in True Orbs, faces can be seen or there is a three dimensional aspect to the orb. Still others will “analyze” their images by running them through filters available in common digital image editing software available for your personal home computer – software designed for specific, artistic effects and not for scientific inquiry. This software, like photography itself, is based upon values, shades and hues of color and cannot actually tell you if an object is three-dimensional or not. It is still your mind that makes the final determination and, as anyone knows, the mind can be easily fooled.In this age of digital manipulation, the danger of someone creating convincing, extraordinary orbs is simply a mouse click away. The biggest problem with this is that, aside from common sense, there is no conclusive, arbitrary way to determine that the image data has been manipulated. Although, it may seem obvious to most that a certain object as been rendered in a photo-editing program, to prove such a thing becomes more difficult. Many are so eager to have a paranormal experience that they often overlook the obvious in their zealous pursuit of ghosts. To them, these contaminants become irrefutable proof of the afterlife. This, coupled with their own emotional investments and ambitions, fosters an atmosphere of the die-hard believer, where the infidels of sound logic and the scientific method are casually tossed aside. Placed into historical context, it all makes some sense. In the mid-nineteenth and early twentieth centuries, spiritualism, mediums, ghosts and the occult all took on a renewed relevance. Like the Arts and Crafts movement of the same period, this was in direct opposition to the modernization and industrialization of an increasingly science-based society. During this period, photography was new and many were not entirely aware of its capabilities and idiosyncrasies, so Spirit Photography was born and hoaxes flourished. Many of these spirit photographers utilized long exposures, double exposures and sandwiched negatives to produce their evidence of the afterlife. These images almost invariably depicted the entity as an apparition of human form. But as time past and these tricks were learned, a dark shadow was cast across any image that purported to have captured a ghost. In contrast, orbs, with their copious and instantaneous presence, had the benefit of providing everyone with their own personal ghost picture. These images were personal as well as accessible and since the photographer (and those around him) knew that no one had tampered with the negative, he had reason to believe this truly was a spirit. No longer would this individual be resigned to gaze longingly at those famous ghost pictures, now he too could catch the next “Brown Lady of Raynam Hall” or at least its orb equivalent. So dissuading true believers is a difficult task and perhaps not one worth under-taking. But as I said earlier, what might be accomplished is a method for eliminating false orbs. We will then be left with either nothing or images that cannot be easily dismissed. Perhaps, it is within those images, that True Orbs may be found. By far, the most powerful tool “ghost hunters” employ is the mind. It is paramount that you arm yourself with knowledge. Employ the precepts and principles of science and adhere to its strict protocol. Simply because one uses the trappings and jargon of science, does not make one’s work scientific. That said, the second biggest tool in your arsenal will be your records and photographic evidence is a part of those records. It is therefore, extremely important that you familiarize yourself with photographic techniques and technology. Take a class at a local community college or read as much literature on the subject as you can. But above all, maintain meticulous standards for your photographic technique, they will ensure consistency. As I have always maintained, be your own worst enemy. Your standards should be higher than anyone’s so that when the detractors come calling – and they always do – you will be well prepared to defend your position. Like A Moth To The Flame? "A strange blue cloud seen floating and darting around customers, freezing for 30 minutes and then speeding from an Ohio gas station, remains unexplained even though it was caught on security cams. The ghostly image was seen moving near and over cars at a Marathon gas station located near the corner of State Road and Pleasant Valley in Parma on Sunday. Surveillance video of the image showed it flipping and then sitting in the same location for 30 minutes. It then flies off the screen at a high rate of speed. "It gives me the chills," a witness said. Security video then shows it coming back and resting on a car window before floating away. Several people said they believe the image is a ghost or an angel. "It was an angel," a witness said. "There was an angel here." The owner of the gas station said he was happy the image went away and has not come back. "I actually watched it for 30 minutes and then actually I watched it move and that is when I got freaked out," said owner Amed Abudaaria. Groups of people have traveled to the gas station after word spread of the unexplained event. Watch Local 6 News for more on this story." What prosaic explanations can we present for this anomaly? Given the height at which this camera is mounted, it is logical to assume it is near the light sources overhead. Could this image be a moth, fluttering past the camera? Its color could indicate some type of bluish moth, perhaps a gypsy. Although more a bluish-green, Gypsies are common in Ohio and if one factors in the color distortion caused by the overhead florescent (or perhaps mercury vapor) lamps, color might not be represented accurately in the video. The object appears extremely blurred - beyond the point of even discerning the most nascent of features. However, if this "video" is, as it appears on the website to show, taking a still digital image every few seconds, then this could explain why the object appears so indistinct. If these shots were at a higher frames-per-second rate, then we might have glimpsed a clearer shot of the anomaly. Reuters has this story on Yahoo! today. To the right, is my fun-with-photoshop piece entitled "UFO at Arecibo"
If you are interested in purchasing my book onparanormal Oklahoma, use the Paypal link above or e-mail s t r a n g e s t a t e o k @ y a h o o . c o m [kerning expanded to prevent spam]and we can fill your order. These are the cases you want to avoid getting sucked into by eager witnesses. They are, by and large, archetypal expressions of the human condition given life in the guise of urban legend. Urban legends are simply modern folktales that express our fears via contemporary themes. Such classic fears are: the dehumanization of a mass- production society, exemplified by tales of rodents or body parts found in sodas or fast food restaurants (although both do occasionally occur). Another fear is the distrust of our fellow humans in an increasingly dangerous and demoralized culture. An example of this would be the tale of the individual who wakes up in a tub of ice with his kidney removed and a note written on his chest telling him to get to a hospital or die. These tales are modern Grimm and serve the same needs in the human psyche. They warn us of the evils in the world while preparing us for their eventuality. In that sense, we find absolution from responsibility in the understanding that there was nothing we could do about it. But these urban legends also extend beyond the natural (if improbable) to the supernatural. There are many urban legends about ghosts and within these we can find repeating motifs, or archetypes. By examining the psychology behind these tales, you will come to a greater understanding as to why – unless presented with further evidence – you should not bother to investigate these legends. This is an old tale that folklorists have had a hard time pinning down. Its origins are unclear but the earliest accounts can be traced to Maryland and Ohio. Since then, nearly every state and every town has a "Cry Baby Bridge." This tale usually involves a young mother who is crossing a dangerous (rainy, icy, dilapidated) bridge in the night (the time of fear and darkness) on her way to someplace (often a boyfriend or such) when her car loses control and falls off the bridge, killing both mother and child. It is from there that the stories arise of how if you go to the bridge at night you can hear the pair’s plaintive, ghostly wailing. Our supposition is often that she is a young, unwed mother and therein lies the tale’s ultimate theme: teen pregnancy or pregnancy out of wedlock will lead to tragedy. We can break the tale down and see the key components more easily. The dangerous bridge is the biggest physical feature of the story and symbolizes the treacherous crossing into adulthood and responsibility; her adult relationships and motherhood lie on the other side. However, the young, unwed mother has fallen from that path with her new child. She has crossed the bridge (or journey into adult responsibility) too soon and has paid the ultimate price. The child’s ghostly cries are an ever-echoed warning of taking on those adult responsibilities before you cross the "bridge." Variation: La Llorona (the Weeping Woman) of Hispanic lore is well known in Latino communities and serves the same essential archetype. La Llorona is often said to be weeping for the child or children she had foolishly drowned in a well. Although sometimes, she weeps for a lost love. This tale often involves some rundown and abandoned house on the outskirts of town where it is said that a satanic cult once performed black magic and bloody rituals involving the slaughter of infants. A demonic spirit or presence is said to still pervade the bloodstained walls, upon which pentagrams and other occult symbols can be found. This tale really took off in the 1970's and 1980's when Satanism hysteria swept the nation. Claims of ritual killings and other criminal enterprises were attributed to Satanists. The FBI investigated much of this in the 1980’s and found these tales to be without merit. But fears die hard and even today whenever a drunken kid spray-paints a pentagram, the local papers will decry how Satanic cults have taken a hold of our children. The tale can be broken down quite easily to a warning: stray from your Christian beliefs and you could die. It is a feel good moment, to be sure, but it expresses the fears of many Christians who believe demonic spirits can posses the weak. Therefore, they feel fortifications must be built to protect their children from things such as ouija boards, roleplaying games, and certain music, which they see as the stepping stones toward satanic worship. The Satan House (a dilapidated structure, suffuse with dark iconography) is often a trope for the decaying soul of one possessed by the devil. It is a vague yet ubiquitous legend and nearly every city from China to Chinatown has some version of this tale. It is the color of her dress that tells you the real story. Sometimes a bride, the lady in white represents purity and her forlorn presence after death is attributed to a fall from grace and innocence. If she were truly pure, she would have ascended to heaven (even if she was murdered). This forlorn image compels us to face the fact that tragedy can strike when least expected – even in moments of pure bliss. Perhaps it exists as a warning to cherish each moment or perhaps simply as a macabre reminder that none of us is safe. These emerge usually during shifts in cultural paradigm, such as the newly liberated women of the 1920’s (Resurrection Mary) or the Hippie movement of the 1960’s and 1970’s (The Vanishing Hitchhiker). Resurrection Mary was seen by many as a raucous and "thoroughly modern" flapper girl of the 1920’s, reveling in a new-found freedom for women. Her tale of woe is most likely a warning to young girls of the time that this new liberation would lead to ruin. The Hippie version echoes the same sentiment but for a later generation, a generation that saw hippies as shiftless, lazy, drug addicts who would demoralize society with their "Free Love." This link takes you to images from a recent Lake Hefner UFO sighting that was forwarded to the folks at Rense by Oklahoma's very own pioneer of paranormal investigations, Hayden Hewes. Shortly, I will post more in length about this man who has investigated UFO's, Sasquatch, and a host of other anomalies in the sooner state - years before anyone else. And, going back to my earlier post regarding the media blindly regurgetating the erroneous tale that Augusta Houghton haunts Guthrie's Stone Lion Inn, I present this for your examination. Though I loathe such a sensational name, I do look forward to the sasquatch episode tonight. Go to the History Channel's website to see some great teaser clips. If you have not yet had the pleasure of visiting http://www.ghostsofamerica.com/, let me now introduce you to this portal of fraud. I encountered this site not too long ago when an acquaintance mentioned his school in Arecibo, Puerto Rico was purportedly haunted. So I did a Google search for any information I could find. One hit that looked promising for - if nothing else - some good "my friend's dad said" stories was Ghosts of America. Soon, I found they did have a Puerto Rico section, which included Arecibo. I read through all of the accounts and quickly grew quite bored because, as I expected, they lacked any details that I could follow up on to authenticate these urban legends. Well, just today, as I was trying to corroborate a mention of a haunted high school in Chickasha that I found mentioned in a The Oklahoman article from 1912, I once again found myself on ghostsofamerica.com. And, as before, I read through these sketchy blurbs devoid of any details. However, as I read, I began to feel the oddest sense of deja vu (deja boo?). I swore I had read these exact same accounts just recently and the only other time I could recall having visited this site was when I researched Arecibo. So, on a hunch, I pulled up that page again as well and began an account-for-account comparison of the two pages. Below are excerpts of what I discovered. I believe the results speak for themselves and there is no need for me to draw any further conclusions. It is obviously a site replete with fraudulent accounts and I urge EVERYONE to ignore this site 100%. In no way should these tales be taken seriously - even as urban legend. A man with a large hole through his torso has been observed on a few occasions on a Chickasha street around midnight. The ghost of a young woman dressed in a bloody wedding dress has been seen on a few occasions late at night running after a passing car on a dark road outside Chickasha. 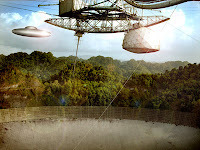 The ghost of a young woman dressed in a bloody wedding dress has sometimes been seen hovering in the air like a balloon in Arecibo. The ghost of a young air force pilot has often been witnessed trying on shoes in a Chickasha house. The ghost of a young air force pilot can be seen very often in an Arecibo house. AND A female shape can often be observed trying on shoes in an Arecibo house. The ghost of a young woman with a rope around her neck was observed looking at people in a Chickasha home through an air vent. There have been other reports involving this ghost in the vicinity. The ghost of a young woman with a rope around her neck can be witnessed very often searching for something under parked cars in an Arecibo parking lot late in the night. A woman with worms crawling out of her eye sockets has often been witnessed talking into the thin air as if someone else was there. A woman with worms crawling out of her eye sockets has been witnessed on numerous occasions riding on a horse along a highway outside Arecibo. The ghost of a farmer in a straw hat showed up in a deserted area outside Chickasha. The ghost did not care that there was someone else there. The ghost of a farmer in a straw hat can be witnessed very often in an Arecibo area hospital, walking the hallways. A bat that turned into a vampire has sometimes been observed standing along a highway outside Arecibo. The ghost of a badly mangled hunter dragging a dead bear has often been seen seated at a table in a Chickasha house. Other sightings of this ghost have also been reported. The ghost of a civil war soldier is often seen [in Arecibo??] appearing in a bathroom mirror. The ghost of a civil war soldier can sometimes be witnessed snooping in people's mailboxes around midnight in Chickasha. COMBINED WITH: A black cat that turned into a woman can sometimes be seen sitting in a chair in a house in Chickasha. A black cat that turned into a woman showed up snooping in people's mailboxes around midnight in Arecibo. The witness fled when she saw the ghost. The Shawnee Expo center was abuzz with lovers of reading and books on day one of the festival. In many, many ways this is one of the best book festivals around! Authors, publishers, scholars rubbing shoulders with the writers "just starting", " still dreaming of doing it", and the "not there yet but working hard". Storytellers and music and the lively Oklahoma spirit! What a way to celebrate the Oklahoma Centennial than through words and story! The HUDSON HOUSE/WHORL BOOKS booth was often busy as people stopped to view the collection of titles: Strange State:Mysteries and Legends of Oklahoma by Cullan Hudson; Elephant Hips Are Expensive by Marilyn Hudson and illustrated by Haley Fulco; Off the Page! Basic tips on conducting a storytime by Marilyn Hudson. Also generating some interest were the free services from PROFESSIONAL REVIEW SERVICE (www.reviewservices.blogspot.com) offering review potential for the self-published or emerging author.